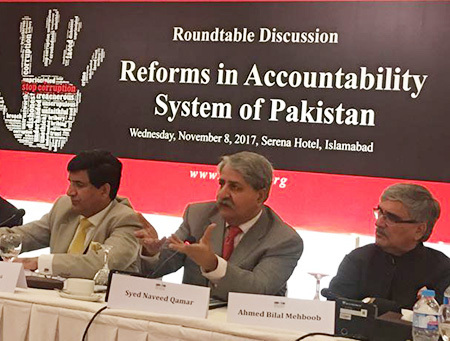 November 8; At a PILDAT Roundtable discussing Reforms in Accountability System of Pakistan that brought together prominent representation from PML-N, PPP & PTI, politicians disagreed on whether or not to have across-the-board accountability in Pakistan that should apply to all State institutions including Judiciary and the Military. With Senator Muhammad Javed Abbasi, belonging to PML-N and member of Parliamentary Committee on National Accountability Law in the chair, Syed Naveed Qamar, MNA andSenator Farhatullah Babar represented the PPP and Mr. Shafqat Mahmood, MNA, shared the perspective of the PTI at the Roundtable. Speakers also included Mr. Shahid Hamid, Senior Advocate Supreme Court and former Governor Punjab, Lt. Gen. (Retd.) Moinuddin Haider, former Federal Minister of Interior, Former Governor Sindh and Mr. Mujib-ur-Rehman Shami, Senior Journalist. Opening the roundtable, Senator Javed Abbasi said that the Parliamentary Committee on National Accountability Law had been established after the case of plea bargain of the Balochistan bureaucrat. He said that the Committee had achieved marvellous progress with political consensus on draft national accountability commission act (NACA) but lately political considerations seem to have made parties revise their positions. He believed that across-the-board accountability is the only just and effective way to establish accountability in Pakistan. He lamented that it will be Parliament’s biggest failure if it fails to legislate on a new, effective, credible accountability law for all. If existing systems of internal accountability were working in Pakistan, we would have been a corruption-free country today, said Senator Abbasi. Sharing his views on provincial accountability laws, he said that if Pakistan’s Provinces are excluded from the ambit of accountability, the law will only cover a minority of the system. Senator Farhatullah Babar said that issues relating to corruption only should be under the domain of one accountability institution. What Parliament and Parties have agreed by not having across the board accountability for all is a surrender akin to the December 16 surrender of East Pakistan. He said that his stance to support accountability for all emanated from his party’s position and he was surprised and embarrassed that his party now joined other parties in the Parliament to say that the accountability law should not extend to all institutions of the State. Mr. Shafqat Mahmood said that PTI believes that the ambit of existing NAB law are too wide and the focus should have been on public office holders only. He said that PTI did not change its policy overnight and PTI discussed this important issue of accountability for an hour and a half to reach this position. On the subject of accountability for all, he said that PTI believes that Judiciary is considering serious cases and at this stage putting judiciary under political influence of accountability will not be beneficial. Similarly, he said, putting Military under politically-influenced accountability at this stage when Military is fighting a sensitive war is also not the right time to do so. Lt. Gen. (Retd.) Moinuddin Haider said that the NAB law follows good practices of accountability mechanisms world over which also include concept of plea bargain. He said that despite starting out as an effective institution, NAB was politicised later under General (Retd.) Musharraf. He believed that accountability should be for all in Pakistan including Judiciary, Military and should also include Journalists. Mr. Shahid Hamid said that all political parties have succumbed to the pressure to not have accountability for all. Judiciary is of the view that its protected under Article 209 of the Constitution and such a law, if passed, may be struck down. Having a Commission of 4 members instead of one chairperson of NAB is a good thing and parties can develop consensus to do so. However, if parties disagree on a new law, the existing NAO can also be amended. Mr. Mujib-ur-Rehman Shami said that in order to strengthen accountability procedures, the existing institution must be strengthened so that NAB or a new commission can focus only on a specialized field. He said that if the systems of internal accountability are such a valid argument for not bringing all State institutions within the ambit of one accountability law, then Parliament should also conduct its own accountability through committees and only file a reference to courts, where needed. In a similar fashion, business persons have the chambers and should undertake internal accountability and other entities should also follow suit. 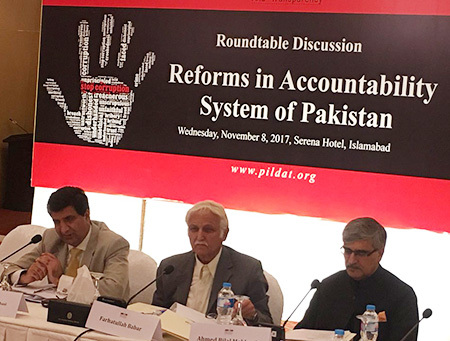 Introducing the subject of the Roundtable Discussion, Mr. Ahmed Bilal Mehboob, President PILDAT said that the country is witnessing afresh the quest for a consensus on a new accountability law. Initially, the major political parties had appeared to agree on repealing the existing National Accountability Ordinance, 1999. However, key disagreement on the scope of the proposed lawis reportedly on extending the proposed law’s scope to include officials of the military and judiciary by enlarging the definition of ‘public office holder.’ Opponents of the proposed expansion hold that both the military and judiciary have their own internal systems to hold their respective officials to account, and that, therefore, the proposed expansion is uncalled for. Supporters for the inclusion of these institutions feel that the latter’s internal accountability mechanisms are not effective and have seldom been used for curbing corruption in military and judicial ranks. However, if this premise is to be accepted, each institution, including Parliament, civil bureaucracy and others may also wish to follow suit and have internal and exclusive systems of accountability. Senator Usman Kakar of the PMAP said that it is ironic that the owners of the country – which are the citizens as per the Constitution- are under the ambit of accountability while servants of the State are above accountability. He said that political considerations against accountability for all will only hurt the country more. MPs who joined the discussion included Senator Azam Musakhel, Senator Usman Kakar, Ms. Nafeesa Khattak, MNA, Ms. Sabiha Nazir, MNA, Alhaj Shah Jee Gul Afridi, MNA and Engr. Mr. Hamid-ul-Haq, MNA. A large number of civil society representatives, academia and media persons joined the discussion.